The modern trends in the development and application of precast concrete bridges are discussed. 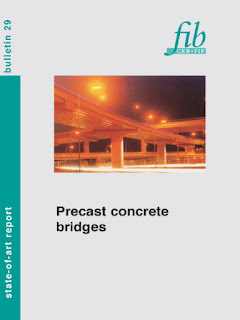 The development of precast bridges has been mainly done by the precast industry in collaboration with public authorities. Initially, the projects were based on beam systems with a cast in-situ deck. Later on, the developments went towards more completely prefabricated systems, such as with box beams. Precast beam bridges are well suited for moderate span projects, where realization of classical scaffolding supported on the ground is difficult and expensive, and where speed of erection is mandatory.